You bought a new toy for your backyard? Congratulations! We hope you and your kids will have plenty of fun hopping about. However, owning a trampoline does bring some responsibilities too. Good news is, maintenance is usually simple and doesn’t take much time. One of the integral parts of ensuring that your new trampoline stays in tip-top shape is cleaning it regularly. They can be a significant investment, so it pays to care for it. But how and when? We’re here to help. How to clean your trampoline? Sweeping is the simplest way of cleaning your trampoline. This is the method you will use the most for daily cleaning. If you leave the trampoline uncovered when not in use, various pieces of debris can accumulate. This includes stones, dust, and leaves, especially during autumn. These can be dangerous for kids to bounce on, as they can get hurt on a stone or slip on a leaf. Pebbles can even damage the trampoline by tearing through the mat and the enclosure. That’s why we recommend you sweep the trampoline if you see anything start to accumulate. Any household broom will do, just make sure it’s not too rough on the mat surface. You can make things easier by removing the safety pads to prevent debris from getting trapped between the mat and them. Sometimes, simple sweeping just won’t cut it. Bird droppings, mildew, dried-out mud, and other unpleasantness can make trampolines their home, and simple sweeping won’t get rid of them. This is especially common after rainfall. 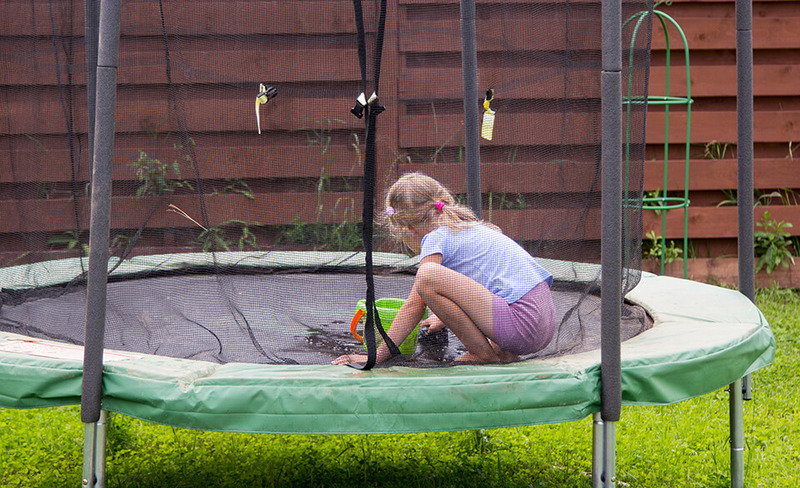 While rain in most cases should rinse off the trampoline, dirt can accumulate and make matters worse. That’s when you can go nuclear: get a garden hose and simply wash it all away. It is best to angle the trampoline slightly so that the water can naturally drain off the trampoline. A good ole’ hosing should do plenty to keep it clean. Let the mat dry in the sun and you’re all set. Mats won’t get damaged by water, but don’t let them wet for too long to prevent smells from developing. In most cases, the enclosure netting won’t be dirty, so feel free to remove it beforehand. Don’t use pressure washers. They can weaken the fabric of the mat and cause it to fail prematurely. If your springs and the frame aren’t galvanized, we recommend you dry these parts out as soon as possible. A simple rag will do – or a hairdryer, perhaps, if you’re feeling meticulous. Just don’t blow too hard for too long, as the heat could warp the metal parts. Even a garden hose can’t get it sometimes. This will happen if the trampoline has been left out for too long and the dirt has solidified, almost glued to the mat. Scrubbing is also necessary if moss has started growing or the mat has become smelly. Bird droppings are quite dangerous as well. They can ‘eat though’ the fabric of the mat and damage it. We recommend you use a mild detergent solution to aid your scrubbing efforts. Add a few squirts of dish-washing liquid to a bucket of water. Use either a gentle brush or a sponge. Do not use metallic, abrasive wire sponges. Remember that the mat is woven and these can cause tears to the fabric. Cover every part of the mat by scrubbing in circular motions. When you’re done, wash it away, either with a hose or water from a bucket. Leave it out to dry and you’re done! If you’re concerned about sun rays damaging the trampoline, you can dry it out yourself with a dry cloth. We don’t think that’s necessary, however. After the trampoline has dried, you might want to look into UV-protection sprays to use over your mat. These could provide additional UV protection to your trampoline. If you have cleaned the safety pads too, make sure the foam inside them is completely dry. Try opening them up and squeezing extra moisture away. If left moist for too long, mould could grow in the safety pads. This is both a security and a health risk. Pay attention to the zippers, too. Lubricate them with grease so that they zip and unzip nicely. Getting stuck on a trampoline due to a faulty zipper is never a pleasant experience. It is best to remove the enclosure if you won’t use it for a while. While cleaning, inspect the frame for any damage and rust. Grease any parts where you see rust forming. This will prevent it from advancing. If you notice squeaking and creaking coming from the springs, it’s time to lube them up too. Apply grease or spray lubricant and enjoy a quiet experience all over again. If you’re using water, it is best to clean during the sunniest, warmest parts of the day. This would generally range from noon to 4 pm. The water will then evaporate the fastest and leave the trampoline looking sharp. Avoid cleaning if rain is about to fall, for obvious reasons. Do not use water to clean the trampoline during the winter. It could freeze if improperly dried out. That presents a host of other problems on its own; the structural integrity of the trampoline itself could be ruined. Sweep the trampoline every once in a while, more often during autumn. Some amount of debris is expected, but don’t let it accumulate. Wash it as necessary, but usually not more than once a month. Trampolines don’t get dirty that fast, and it’s not environmentally friendly to waste so much water on that. Remember to let the mat dry fully before jumping. Wet mats can be extremely slippery and present a huge health hazard. Accidents can and do happen this way! Cleaning your trampoline is like doing oil changes on your car. It’s simple, inexpensive, but extremely important for overall service life of the trampoline. Regular cleaning will also make your trampoline look like new for much longer. It is also safer for children, who won’t get hurt by stones and pebbles. Considering the benefits of cleaning, it’s really a no brainer practice that all responsible trampoline owners should adopt.